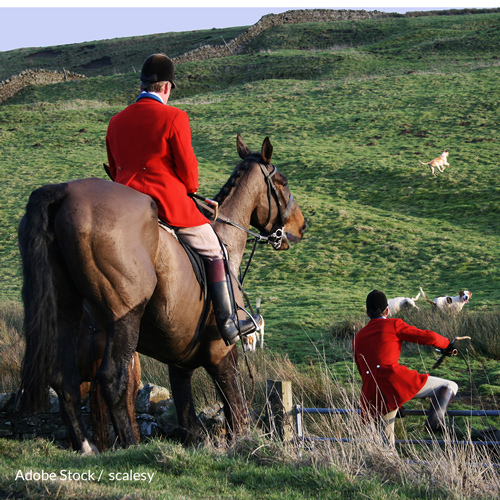 Although fox hunting has been banned in England and Wales since 2004, many hunters still illegally partake. The hunters use a loophole by calling these hound hunts "trail hunting," with the hounds following a scent trail, even though foxes are still being chased and killed. Still, the hunt doesn't usually stick to a particular trail. Help put an end to the cruel practices of hound hunting. Sign now and call for an explicit ban of hunting with hounds. Demand that the 2004 Hunting Act is updated with stronger restrictions that are appropriately enforced. The blood sport of hound hunting needs to come to an end across the United Kingdom, and all legal loopholes need to be closed! Innocent animals do not deserve to be chased and then torn apart in the name of sport. Animal torture is neither sport nor entertainment. Despite the ban of fox hunting in 2004, it continues to persist, as hunters have found ways to circumvent the law. Both the hunters and hounds are raising havoc and fear when they take part in these hunts, and they're leaving destruction in their wake. Vegetation and wildlife are often ravaged after these hunts occur. Hunters have been known to threaten and intimidate people who oppose the illegal hunts, and this needs to stop. The 2004 Hunting Act must be updated with stronger restrictions that are sufficiently enforced. Everyone needs to abide by the law, and those who disobey must face the appropriate penalties and prosecution. Your swift action to these unlawful acts is greatly appreciated. That's 21,000 signatures! Let's keep the ball rolling.